Sue Nyathi, author of The GoldDiggers answers questions from fans. An investment analyst by day and a storyteller to her son at night. Sue Nyathi was born and raised in Bulawayo and now resides in Johannesburg. Her first novel, The Polygamist, was published in 2012. 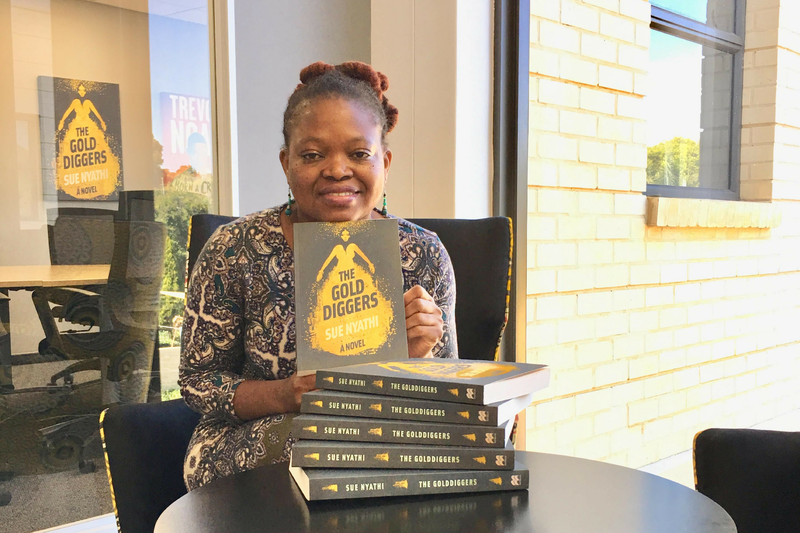 She’s back with a riveting new book, The GoldDiggers, which tells of stories of a group of passengers who embark on a treacherous journey from Zimbabwe to Johannesburg, the City of Gold, to find refugee and pursue a better life. Exclusive Books recently hosted a live Twitter Q&A session with Sue Nyathi as part of their annual Homebru Campaign, which promotes the finest range of South African books during the month of June. We’ve put together some of the questions from fans, customers and readers and Sue’s answers. The Gold Diggers introduces the reader to a number of characters. What was your character development process? I created those characters with great deliberation because each one has a distinct story to tell. I won't expand on all the characters but for example, Gugulethu highlights the plight of child trafficking which is a prevalent problem. On the cover, the depiction of Johannesburg is a female figure. Is there a specific motive behind this detail? Yes, there is. I honestly believe Johannesburg would be female. The same way we refer to Cape Town as the Mother City and not the Father city. So, I allude to Johannesburg as a woman in the book hence the cover! Which of the characters resonates most strongly with you and why? This is always a difficult question to answer because I love all my characters. They are like children. In writing them I often live vicariously through each one. If forced to, I could possibly whittle it down to Portia. I love how you have different South African cultures in your book, from Hulisani Mulaudzi to Nomonde. Why Hulisani Mulaudzi? As for the name choices, typically I choose names that I love so there is always subjectivity! I also wanted to highlight Venda people in literature. I feel they are often down played. Your first book The Polygamist was published 8 years ago. On writing The GoldDiggers did you experience writer's anxiety at all, seeing that your first book was highly popular and successful? I did because I had 'reputation' to live up to. This is why I decided to write something totally different because I didn't want people drawing comparisons between the two! Would you say The GoldDiggers was challenging to research compared to your other work? Yes, it was more challenging in terms of research. I also wanted to tell a great story with authenticity. I enjoyed the research immensely. Writing this book also challenged me as a writer. Everyone and anyone!! If you have ever been curious about the journey of an immigrant into a foreign country then this is the book for you! What was your inspiration behind writing the book? The outbreak of the xenophobic violence in South Africa. Not that one could call that conflict inspirational but it certainly motivated my decision to write this book. Xenophobia is not the main theme of the book. I did not interview any victims even though one of my characters does become a victim of xenophobic violence. I did extensive research on Johannesburg as this is where the book is set. I read a lot around the xenophobic violence relying on newspapers and the Internet and other secondary sources of research. I read a lot around the xenophobic violence relying on newspapers and the Internet and other secondary sources of research. Your knowledge of JHB is incredible... Just wondering how many days and nights you spent in places like Hillbrow? Cumulatively, I may have spent a month walking the streets of Hillbrow and the Inner city extensively taking notes! Told with brave honesty and bold description, the stories of the individual immigrants are simultaneously heart-breaking and heart-warming. Get your copy of The GoldDiggers and follow the conversation on social media using #TheGoldDiggers. It’s 2008 and the height of Zimbabwe’s economic demise. A group of passengers is huddled in a Toyota Quantum about to embark on a treacherous expedition to the City of Gold. Amongst them is Gugulethu, who is hoping to be reconciled with her mother.